Over the years, Catering by George's has given back to the community during times of disasters and times of building projects for the future of Mississippi citizens. 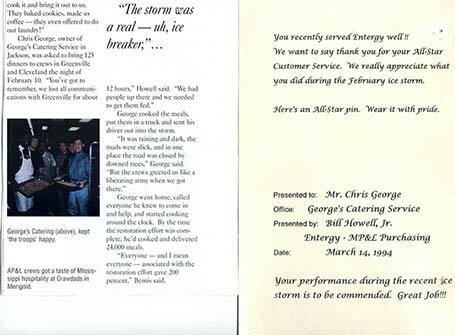 "You recently served Entergy well! Your performance during the February ice storm is to be commended. We want to say thank you for your all-star customer service". "We at Entergy Mississippi wish to thank your company for supplying us with much needed services and supplies as we took on the greatest challenge in our history. 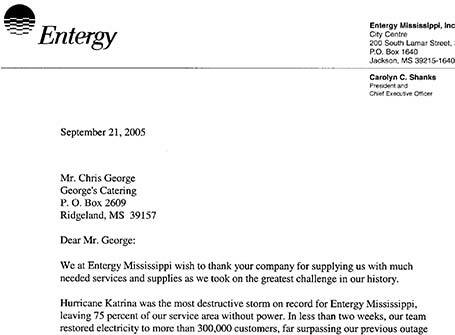 Hurricane Katrina was the most destructive storm on record for Entergy Mississippi, leaving 75 percent of our service area without power. In less than two weeks, our team restored electricity to more than 300,000 customers, far surpassing our previous outage record of 94,000 set during the ice storm of 1994. More than 3,000 workers, including linemen, tree trimmers and support staff from 20-plus states combined forces to repair electrical equipment damaged by high winds and fallen trees. And more importantly, these repairs were completed safely and sooner than we anticipated. Our performance was directly enhanced by the responsiveness and professionalism of our vendor network. At no other time in our history has your support been so vital, and we appreciate all of your efforts in helping Entergy Mississippi fulfill our commitment to customers during this unprecedented challenge." "I wanted to pass along my thanks to you for helping us build the Kid Zone Playground at LeFleur’s Bluff State Park in Jackson. Thanks to you and other civic-minded people like you, we were able to build 18,000 square feet of fun in just eight days! Words cannot express my appreciation for your tireless efforts to manage the care and feeding of our never-ending stream of playground volunteers. From well before the day began until nightfall, you were on top of the situation every step of the way. From my own experience, I can well imagine the sacrifices you made personally to your family and your business while supporting our needs. I hope you and they know how much your help meant to me personally and to our community." "Chris, thank you for your generous donation of the wonderful dessert tray for Ridgeland High School’s second annual faculty and staff “Back to School” event! The support and cooperation of the Ridgeland business community has been overwhelming. We appreciate your contributions for helping to make RHS’s first year so successful. We look forward to the partnerships we have formed continuing for years to come. Thank you again." Read what customers are saying about our food, service and hospitality. "Chris, you and your staff did an excellent job! Our reunion was a wonderful and special occasion that would not have been possible without you all! Your staff was so friendly, and the food was delicious! Thanks again--it went far better than we could have imagined. Again thanks so much for everything!" "Just to say Thank You"
"Chris, thank you for making our wedding for Jenna and Yale special. Everything was wonderful, and the ladies that served at the wedding were wonderful. Thank you again for everything." "I wanted to thank you for your help and generosity Monday at the commercial shoot. Everything went very smooth. I wish you would thank Peter and Mary as well. You have a great team there. Myself and Lovecomm appreciate all that you do for us. I wish y’all continued success!" "A special 'thank you' to your staff"
"Chris, my sister had a blast at her 40th birthday celebration. The room was absolutely beautiful, and the food was not only good to look at but delicious as well. That’s probably why there was nothing left. A special 'thank you' to your staff; they were especially nice and attentive. I have only received positive feedback from all who attended. Thank you again." "Chris and Staff, thank you for working with me to make my birthday so special. I greatly appreciate all that you and your staff did." "Chris, many thanks again to you and your staff for helping to make Mary’s reception such a wonderful event. You were all so patient and helpful throughout the planning process. You made it so easy for us to arrange everything. We had an enjoyable time, even this anxious Mother-of-the-Bride!" "Wonderful help on today's lunch"
"Chris and Staff, thank you for your wonderful help on today’s lunch with the children. Everyone enjoyed the delicious lunch, and you made it worry free!" "Chris, I just wanted to let you know how great and beautiful everything was for the Provine Class Reunion Mixer that was held at your facility. Your staff that served and assisted were great as well. Thank you." "Chris and Staff, thank you all so much for doing such a wonderful job with our wedding reception. The food was great and everything was set up beautifully. The staff did a fabulous job, and we didn't have to worry about anything except having fun! We would recommend you to ANYONE!!!! Thanks again." "Chris and Staff, we would like to thank you for your services at our wedding reception. The food display was wonderful and the wait staff and bartenders were very professional and easy going. Thank you for a successful party, we enjoyed ourselves." "Chris, thank you for making our reception a great experience. Everyone has complimented the food and the table settings. Due to your being so organized we were able to enjoy ourselves. Thank you!" "Chris, we would like to express our complete satisfaction with the facilities quality and service you provided for our wedding reception. Your staff did an outstanding job of preparing delicious food and providing great service to our guests. They were truly impressed the minute they stepped through the door until the evening ended. No one including me had ever seen such a beautiful presentation with ice sculptures and flowers. Many thanks." "Chris and Staff at the Pointe, I had the best engagement party at your facility, and I was very pleased with the services rendered. Thank you for making our engagement dinner a memorable event!" "Chris and Jim, thank you for the outstanding job on my parent’s 50th anniversary. It was a wonderful party and the food and the set ups were terrific! Thanks a million for all that you did!" "Chris and Jim, our reception was truly magnificent, and we appreciate all that you and your staff did to prepare for the event. Everyone admired and complimented the staff on their friendliness and helpfulness. We applaud you on a job well done. We appreciate your going the extra mile to ensure that all was accomplished with perfection. Your professionalism could not be surpassed. Thanks you once again for helping to make this event a most memorable one for years to come." "Chris, just a note of thanks to you and your staff for a job well done. The food and service were FABLUOUS! I wasn’t sure what to expect, but it was wonderful surprise to enjoy the delicious food. So many of the members of my organization were so impressed. Congratulations on a job extremely well done." "Chris and Crew, a letter of thanks for all your help. We think this was one of our most successful proms do far. What a wise choice we made by using your facility. Your staff was very helpful and professional. Thanks!" "Chris, we would like to thank you all for the beautiful reception. It was everything and more than I could have imagined. Thanks again!" "Chris, I just wanted to take a moment to thank you again for all you help in making our rehearsal dinner and wedding a wonderful experience. Please give Mrs. Patricia and the other staff a “thank you” from me. They were EXCELLENT, so very accommodating and always professional. Thanks so much for everything." "Chris, thank you so much for helping make our weekend perfect. The basket of goodies was a special touch. We appreciate all that you did to take care of us!" "Chris, you do a FANTASTIC job! Thank you for making our wedding beautiful and stress free!!!" "Chris, from the bottom of our hearts and the depths of our souls, we thank you! You don’t have to do what you do, but you do it anyway, and for that you will be forever blessed! Chris, your goodness is unbelievable. May God continue to bless you, your family and your business." "Chris, I just wanted to thank you for the wonderful job you did for our recent meeting. You selected the perfect menu for our group and the food was delicious. I think every single person attending made a positive comment about the food-that makes me feel good! Thanks again; you really made our meeting a lot more enjoyable." "We are writing to say thank you very much for the warm hospitality and the very nice meals that you provided for us at the Phi Theta Kappa Regional Convention at the Rankin Branch at Hinds Community College. It made our job easier and everyone enjoyed their meals. We appreciate it so very much!" "Chris, once again, thanks a million for a wonderful Christmas Party! The atmosphere and service were so indicative of a family operation-attention to detail, flexibility, and dedication…all with a smile! Thanks for your faith in cable advertising! We appreciate your business!" "Chris, I would like to thank you and your wonderful staff for making our 34th Class Reunion a success. Everyone loved the food and location." "Chris, thank you for your assistance with our fantastic holiday party. The food was great, the decorating was beautiful, and the staff was super friendly. We look forward to working with you in the future." "Chris, we wanted to thank you for all the wonderful job y’all did with our Business After Hours. Everybody was talking about how great the food was and how pretty you had everything set up. Your staff was great too! You really have a great team. Thanks again for everything and making our night so special. You’re the best!" "Chris, the service and the food were just perfect! Thanks for making the party a success!" "Chris, I wanted to tell you how much we appreciate what you did for our rehearsal dinner. Everything was great, and we were able to just walk in and enjoy everything. I owe much appreciation to you and your staff." "Chris and Jim, you have a great operation going! I thoroughly enjoyed the event. We appreciate so very much all your hard work to make things beautiful and allow us to relax and enjoy ourselves. The tables and food were perfect. I wouldn’t want to have another party without you. I had complete confidence in your team that day! Thanks again for a great evening." "Chris, I would like to thank you for a job well done. Your staff was prompt and handled everything professionally. The food was good, and everyone enjoyed it. Thanks again. Looking forward to doing business with you again." "Chris, to you and the entire staff, it is a pleasure to give thanks on behalf of our high school for your hospitality. The food was wonderful and beautifully displayed. My classmates and I will remember this event over and over again. I thank you very much for corporation, kindness, and patience." "Chris, just a note to thank you and your staff for a superb meal at our dinner. The food and service was wonderful-We received many complements!" "Chris, we would like to thank you for a wonderful reunion. We thought the food and service were great and commend you on an outstanding business! Thanks again for a very memorable evening!" "Chris, I wanted to tell you much I enjoyed the party. The food was most delicious, and I appreciate all the hard work that went into the event. It was so nice to come to the event and eat and not have to think about the clean up at the end! We hope to do business with you again very soon."